With a PCR®, Powell is responsible for the complete engineering and design while with Jobsite Built the customer must design the electrical system and the structural design and then package the two. With a PCR, Powell is responsible for meeting all applicable codes standards including local/state codes, ANSI standards, OSHA. With Jobsite Built the customer must research and apply these standards. A Powell PCR is tested prior to shipment by inspection personnel that are completely familiar with the project and the construction techniques. With a jobsite built structure, the completed assembly must be tested by personnel that are unfamiliar with the interconnected equipment and systems. This makes troubleshooting in the event of a problem more complicated. A Powell PCR is portable and may be relocated at minimal cost. A Jobsite Built structure is permanent and cannot be moved. Powell construction is customized to the region. There are Power Control Rooms in every state and more than 70 countries. Canada has a specific design PCR-R® that is perfect for the Canadian market. Jobsite Built structures must be designed from the ground up each time. The Power Control Room (PCR®) concept originated with Powell in the early 1960's. In one facility we custom engineer and manufacture your complete project. From beginning to end our team of Project Managers and Engineers work to produce a tested and ready-to-go solution for your project. Integration expertise is at the heart of our business model as we take on all the management of the project so that you can focus on the bigger project tasks. Our Project Management Team provides you with one point of contact to manage every aspect of your job from commercial to technical to scheduling to logistics we can handle things for you. It is simply what we do and the value of letting our expertise work to make your project a better one cannot be underestimated. Consider carefully your other choice, to have a manufacturer with product sourced from many locations and a third-party integrator. The complexities involved make that a dangerous choice. There is danger of unresolved integration issues, there is danger of unpredictable schedule delays and there is danger of miscommunication. Do not take the risk. Let Powell and our experience give you piece of mind as we deliver a completed and fully functional Power Control Room of any size, to any place, and at any time. 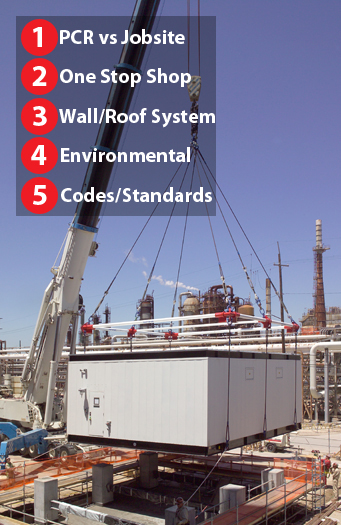 A Powell PCR® is constructed with a structural steel base providing a live floor load of 250 lbs./square foot. Projects requiring greater load capacity can be accommodated. Structural calculations for all structural members are certified by a professional engineer and performed on your specific geometry. The wall system consists of an interlocking exterior panel and interior wall liner. The combination of exterior and interior liners provides the required mechanical strength and a standard wind load of 125mph. Higher wind loads can be accommodated. As a standard, wall panels are fabricated using galvanized steel, but for specific applications can utilize aluminum or stainless steel. Wall height is dictated by the project requirements and shipping restrictions. The roof system design is similar to the wall design and may be sloped or peaked in design. While consideration is given to jobsite conditions, the minimum snow load is 40 lbs./square foot. The ceiling is used to support installation of conduit and lighting systems. Walls and roof may be insulated for normal, cold or very hot conditions. Additionally special construction can be included such as two-story, shipping splits and floor systems. The environmental design of your PCR® is completely custom-engineered. A variety of heating methods are available including electric wall-type, space heaters, or combination heating/cooling units. Thermostats are a standard. Wall mounted cooling units are standard. Air conditioning is sized based upon a variety of factors, including: installed environment; heat gain from mounted equipment; insulation level of floor, wall and roof; as well as the desired operating temperature. For larger PCR projects the HVAC system may be roof mounted, pad mounted, include built-in redundancy, or use separate condenser and air handling units. A PCR can be constructed for operation in Class I, Group D, Division 2 areas using positive air pressure system. For highly contaminated areas the PCR can be designed to include filtering systems to remove air contaminants that may be harmful to equipment installed within the PCR enclosure such as SO2 and H2S. The Powell PCR® will comply with National Electric Code requirements for equipment installation and clearances as well as OSHA requirements for safety including proper operating lighting levels, emergency lighting and panic door hardware. Additional safety features may be incorporated for compliance with identified state and local codes. The Powell PCR is constructed in accordance with The National Electric Code. Powell is in the business of serving the offshore industry by providing maximum value to our customers through complete turn-key project coordination. We expect this to be part of our responsibility as a single source supplier with the capability of engineering design and interface, manufacturing, testing, shipping, and commissioning. The diversified nature of our expertise is the key ingredient of our ability to deliver the value expected by our customers. Provide your technical parameters and environmental requirements and Powell will manage the project from initial design to field commissioning. Our experience is second to none. For more than 30 years Powell has provided custom engineered modules world-wide for application in all types of extreme climatic environments. The benefits of our concept are many. Our 64 acre facility and 600 foot bulkhead is located in Houston with direct access to the Houston Ship Channel, the fourth largest port in the United States. Transportation concerns are a critical element due to the magnitude of these projects. Our extensive experience with shipping coordination by truck, rail, or water can be a big benefit for you and your module. responsibility. Powell delivers optimized turn-key performance through our knowledge of industry standards, code restrictions, certifications, and compliance. We provide an efficient and safe design while meeting the unique requirements of each project. Our experience and know how is a benefit to your project. When your order is placed, Powell assigns an experienced Project Manager to your project. This one point of contact for the duration of the job is coordinated with your needs to provide schedules and updates as required. Customer site visits during all phases of the project are welcome and encouraged. Power distribution is at the heart of any capital investment project and is on the critical path of project tasks. The execution expertise that Powell brings to every project gives you a high degree of confidence in both functionality and schedule performance. Distribution switchgear is the core business of Powell. With 65 years of experience we can make sure that your solution is exactly what you need and performs exactly how expected. Our relationship with you is not just a supplier, but a partner. From the beginning Powell has been a leader in innovation. 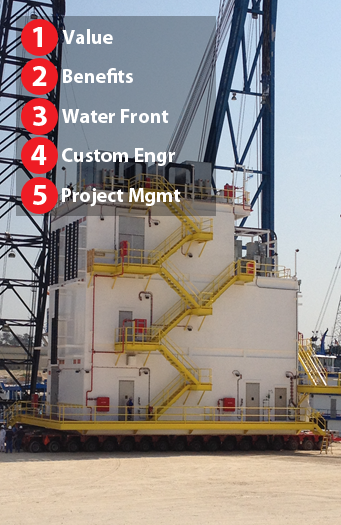 Our engineering staff can provide the expertise to move your project from concept to reality. Let us remove the pain of safety, standards and compliance. It is simply what we do. From concept through the end of life cycle Powell is ready and able to assist with your needs. Let us help with budget estimates. Let us provide design alternatives. Our service team is ready to provide a wide array of options and support. We are just a call away.